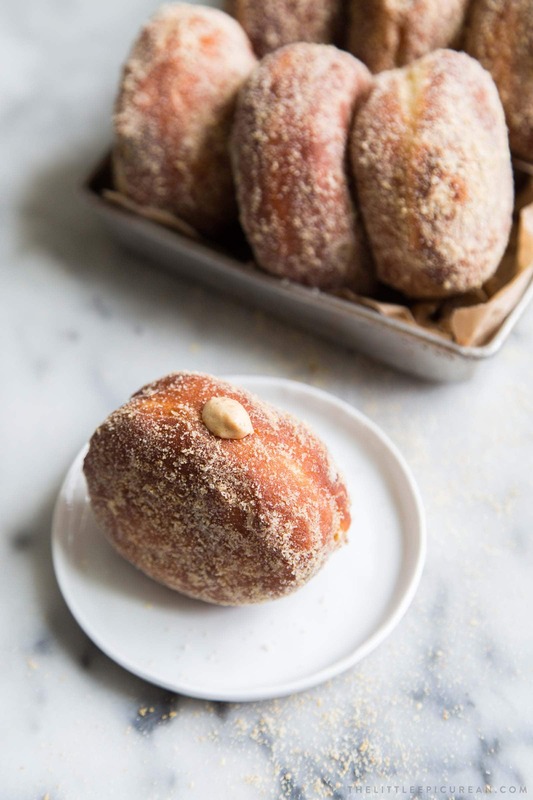 These pumpkin cheesecake doughnuts are brioche doughnuts filled with pumpkin cheesecake and coated in ground graham cracker sugar. My body is 10 percent cake, 10 percent cookies, 20 percent coffee, and 60 percent doughnuts. After making (and eating many of) these pumpkin cheesecake doughnuts, I’m pretty sure my doughnut percentage has jumped to 75. If offered a doughnut, you bet I’m going to accept it and happily eat it. Over the summer, I shared these peach cream filled doughnuts. Using the same brioche-like dough I made these autumn/holiday/winter version. 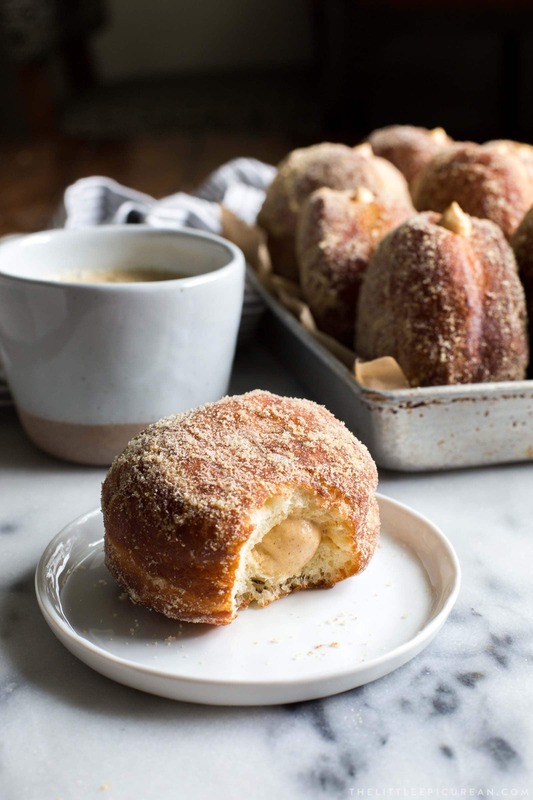 The fried doughnuts are coated in graham cracker sugar and filled with a rich and creamy pumpkin cheesecake mixture. Forget the pumpkin pie this Thanksgiving. Let’s eat pumpkin cheesecake doughnuts instead! Holidays are the best time to make homemade doughnuts. You’ll have people to share with. It’s dangerous to have these at home… alone. It’s far too tempting to keep going back to the kitchen for seconds and thirds. And it’s even harder to deny yourself another doughnut because these pumpkin cheesecake doughnuts need to consumed the day they are fried and filled. Over time the doughnuts lose their luster. As the filling sits, it will make the inside of the doughnut soft and soggy. And because the filling is made with uncooked cream cheese, sour cream, and cream (all things that need to refrigerated! ), it’s best to eat them ASAP. We can all agree that fried foods are delicious- French fries, churros, fried chicken, fish and chips, corn dogs, samosas, mozzarella sticks, tempura, tonkatsu, tater tots, I can go and on. On my list of favorite fried foods, these pumpkin cheesecake doughnuts rank high. 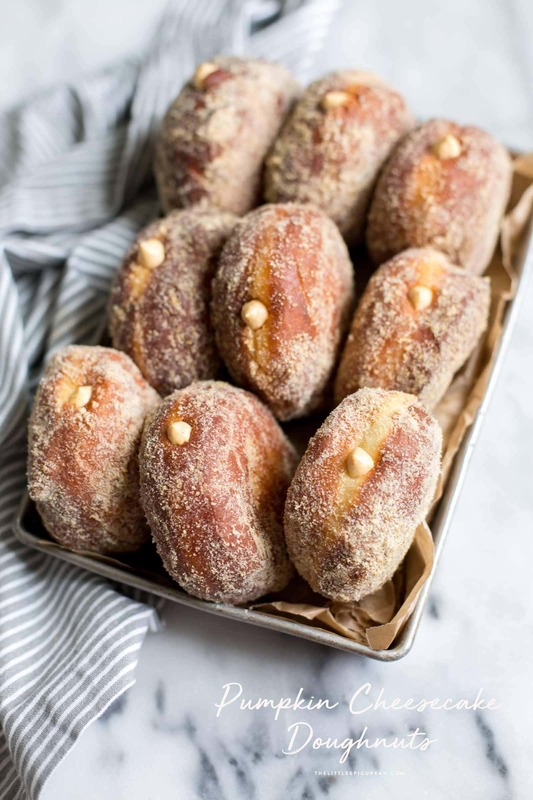 The graham cracker sugar-coating is slightly sweet (not overpowering like standard sugar-coated doughnuts), the doughnut itself is soft and fluffy, and the filling is flavorful and creamy. It’s a treat that I enjoy and eat very slowly. I try to savor each little bite because I know I’ll have to pay for it afterwards with a tough workout. In the bowl of a stand mixer, dissolve yeast and 1 teaspoon of sugar in warm milk. Let sit for 5-8 minutes until mixture is foamy. Whisk in remaining sugar and eggs. Attach dough hook to stand mixer. Add half of flour mixture and salt. Mix on low speed until dough begins to come together. Add remaining flour and continue to mix until dough is shaggy. Slowly add butter, one tablespoon at a time, and increase speed to medium. Knead for 3 minutes until mixture forms a smooth dough. Dough will be sticky, but should easily scrape from the sides of the bowl. Transfer dough to a lightly greased large bowl. Cover with plastic wrap and allow to chill in the fridge overnight (8-12 hours). 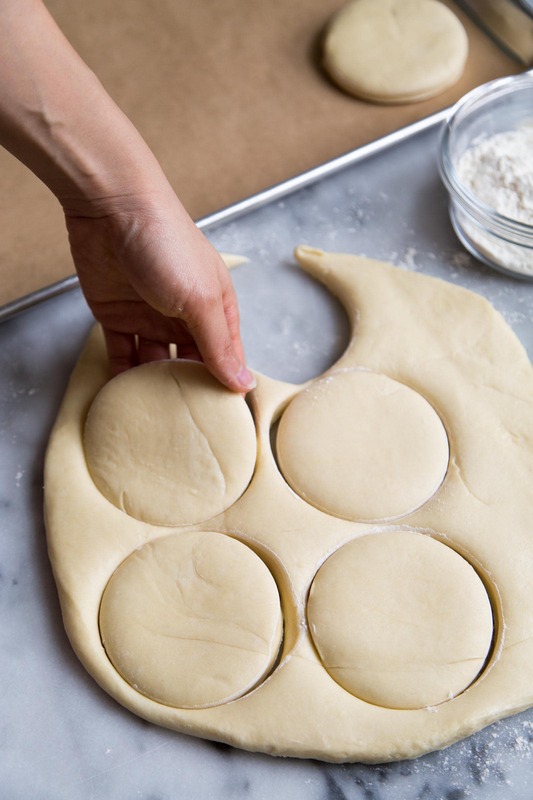 On a floured surface, roll cold dough to about 1/2-inch thick. Using a 4-inch round cutter, punch out doughnuts. Loosely cover rounds with plastic wrap. Let rest at room temperature for 45-60 minutes until doughnuts are puffy. Meanwhile, add vegetable shortening to a large heavy bottomed saucepot (Dutch ovens and cast irons pans work best*). Set over medium heat until oil reaches 350 degrees F.
Carefully place 2 to 3 doughnut rounds into hot oil. Do not overcrowd the pot. Cook for 90 seconds to 2 minutes on each side, until golden brown. Use a slotted spoon to transfer cooked doughnuts onto a paper-towel lined baking sheet. 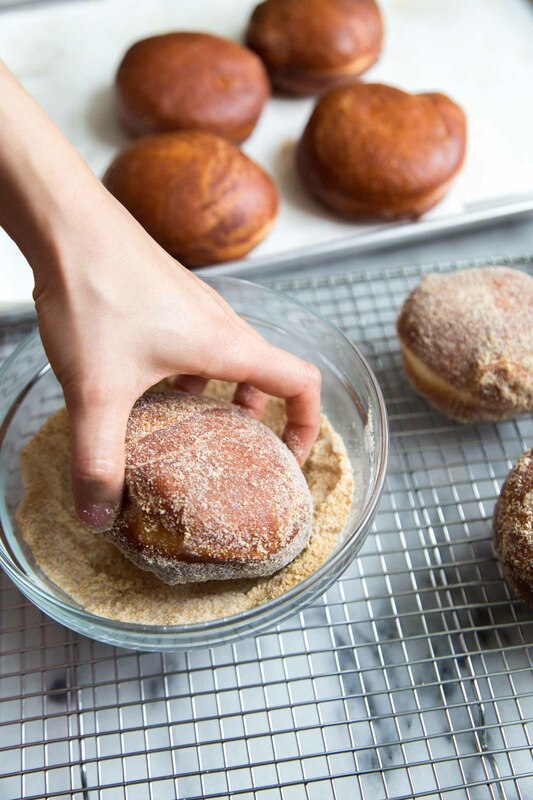 Toss warm doughnuts in graham cracker sugar. Place on wire rack to cool until you are ready to fill doughnuts. Using a hand mixer (or stand mixer fitted with a paddle attachment), beat cream cheese until smooth. Add sugar, sour cream, pumpkin puree, cinnamon, nutmeg, salt, and cream. Mix until smooth. Keep chilled until ready to use. In a small bowl, toss together ground graham crackers, sugar, and salt. Set aside until ready to use. 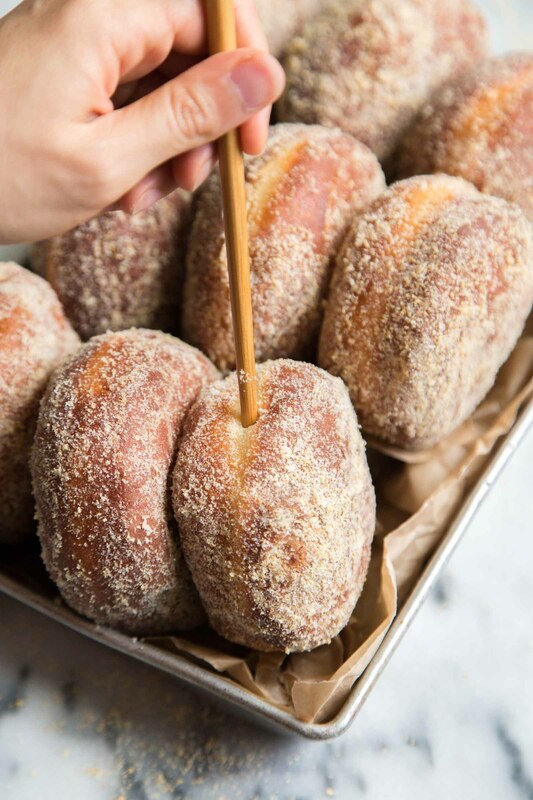 Once coated doughnuts are cooled, use a chopstick to poke hole on one side of doughnut. Alternatively, you can poke holes on each side to stuff doughnut will more filling. Prepare pastry bag fitted with a small round piping tip. Fill pastry bag with pumpkin cheesecake filling. Squeeze about 1/4 of filling into doughnut. Serve immediately. Doughnuts are best enjoyed the day they are fried. Regarding cooking time: sacrifice one doughnut as a tester to make sure doughnut is cooked inside. Adjust cooking time accordingly. Frying in shortening results in a crispier exterior. The doughnut will also feel less greasy than an oil-fried doughnut. Dutch ovens and cast iron pan are great for frying because they maintain temperatures well. Aw, you’re so sweet! I used to be super afraid of frying… but now I can’t stop! Oh, by the name of this recipe, I’m quite sure I’ll be devouring many doughnuts as expected. I tried them during Thanksgiving. I am so lucky to have checked your post, and I guess we can make the best for your future recipes. Your pumpkin cheesecake doughnuts would be a stunner.